All forms of election violence including attacks against women candidates and also abuse of public money and resources, are comparatively less in this local government elections, based on data from NGOs that are observing the campaigns. But data can be misleading because not every incident is reported. Complaints also show that there are hundreds of incidents of violence and that women candidates are being targeted. One Muslim cleric has been observed insulting women with profanities. Election violence monitoring organisations stated that the new electoral voting system adopted at this year’s Local Government Election has reduced election violence. They have witnessed a diminishing trend in the severity of the violence. The executive director of People’s Action for Free and Fair Elections, Rohana Hettiarachchie, told the Sunday Times that while the new electoral voting system has made a huge impact in reducing the incidents of violence, the strict implementation of laws and regulations by the Elections Commission and the police have also played a vital role in diminishing violence. “There have been complaints about misusing public funds, for instance some candidates have rebuilt roads while some have given loans,’’ he said. There have also been campaigns to mislead voters. According to the new election Laws, it is illegal for government field officers to contest, but some have dishonestly nominated family members and are displaying the photos of the field officers to show the voters that they are being backed by those individuals. According to data from PAFFREL, as of January 31, there have been 737 reported violations. A report notes that 121 violations are acts of violence, 69 cases of abuses of state power, resources and misusing state sector employees, and 413 other violations. Mr Hettiarachchie said there have been 90 complaints in the Colombo district as of Thursday, February 1. This is the highest. There has been one complaint from Mannar – the lowest. The National Coordinator of the Centre for Monitoring Election Violence, Manjula Gajanayake, said that distributing goods, using public funds at campaigns and exceeding the number of people used for election activities were the only violations that were treated seriously. CMEV has received more than 400 complaints and the highest number was from the Northern Province at 51 complaints, while the lowest was from Kurunegala District. Mr Gajanayake said there were no major violations. In the previous local government elections held in three stages in 2011, there were more than 900 complaints of which 200 were threats and grievous assault, he noted. He explained the difference in data from each organisation saying it depends on the capacity and commitment. During election campaigns, CMEV has used 70 long-term observers whereas PAFFREL has long-term observers in all electorates. This could also explain the vast difference in complaints data. “We have received 288 complaints of election violence. Out of which, 134 were about candidates carrying out illegal election propaganda, 62 were related to the abuse of public property and misusing state sector employees, and 44 were related to assault and threats,’’ said Rajith Keerthi Tennakoon of the Campaign for Free and Fair Election. According to him in Embilipitiya, a vehicle of a candidate was burnt down and created a lot of chaos. He reiterated that the new electoral system has reduced incidents of election violence. The media spokesman for the Network for Election Monitoring, lawyer Chaminda Gunasekara, said 448 complaints had been received as of February 2. The misuse of state sector employees and distribution of goods, have been increasing, he said. “Army personnel on leave have been engaging in election propaganda in the Matara district. While employees of the National Housing Development Authority have campaigned in the Hambantota District,’’ Mr. Gunasekara said. “We have received 16 complaints of violence against women,’’ Rohana Hettiarachchie from the People’s Action for Free and Fair Election.PAFFREL has received reports from the Puttalam District that violence against female candidates had been organised and directed on a religious basis.“Moulavi Niyas Siddhuk from Thihariya has openly campaigned against women engaging in politics and wide publicity has been give through social media,’’ he said. 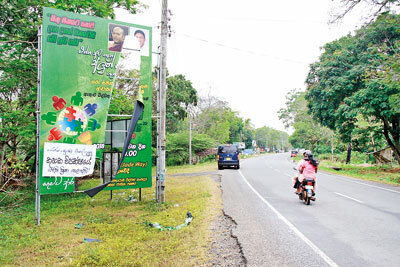 In Thambuttegama, Anuradhapura, a candidate has been subjected to sexual violence, while assaults were reported in Moneragala and Polonnaruwa Districts. There were also reports of damage to party offices in Puttalam, Kandy and Gampaha Districts. The CMEV has received 34 complaints of violence faced by female candidates. Mr Manjula Gajanayake said none of these complaints was filed by the candidates themselves. The data was collated by the CMEV by personally speaking to the women candidates. “The female candidates are facing a lot of violence and inconvenience, houses are burnt down, some of them have received threatening calls and many were not given nominations. There were also instances where at campaign meetings if the main candidate of the particular electorate is female, she is denied the chance to speak to the gathering,’’ he said. Rajith Keerthi Tennakoon said many women candidates are subjected to character assassination and are made to feel uncomfortable during campaigning. “In most areas the woman candidate is not highlighted, instead a powerful male official of the party is portrayed during the campaign,’’ he said. The Human Rights Commission of Sri Lanka has set up an election complaints desk to record violations of fundamental rights of the candidates at local government elections. It will take note of women candidates, in particular.“Most of the incidents do not result in a complaint. We hear them through the media. We have received only a few complaints on violence against women,’’ said. The commission is investigating the assault of a woman candidate in the Wellawaya electorate.